Today, more enterprises are greening their business through a variety of practices. Many companies are investing in energy efficiency. Use a commercial real estate loan for any owner or non-owner occupied, real estate-related green capital expense including acquisition, refinancing, construction or renovation. We have a variety of flexible loan structure and repayment options. Grow your business by financing additional equipment, or take advantage of equity in existing equipment to fund green operations. Benefit from our term loans that also offer flexibility and competitive rates, whether financing permanent working capital or energy efficiency or renewable improvements. The U.S. SBA has loan programs that enable small and growing businesses to obtain loan approval by providing a loan guarantee when necessary. 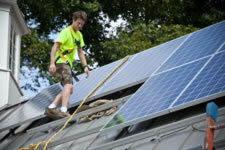 All of SBA's 7(a) loan programs can be used by small businesses to fund green improvements. Company (504) loan program can be used to make significant capital improvements including extensive plant/office renovations to increase overall energy efficiency. We've partnered with the Local Energy Alliance Program (LEAP) and the City of Charlottesville to help you reduce your energy costs, upgrade your facility, and improve the environmental quality of our community. Other energy efficiency or renewable technology projects may qualify. Please email LEAP or call 434-227-4666. Connect with an expert energy advisor at LEAP by calling 434-227-4666 or emailing info@leap-va.org to confirm your eligibility for the Charlottesville Clean Energy Commercial Loan program. At this time, your LEAP advisor will walk you through the process and explain your potential for government and utility rebates, tax credits, and energy cost savings resulting from the energy efficiency improvements or renewal energy upgrades you make. Apply for your Charlottesville Clean Energy Commercial Loan with UVA Community Credit Union by calling our Business Lending team at 434-964-2001 or email business.services@uvacreditunion.org. Charlottesville Clean Energy Commercial Loansare made available through a generous grant from the City of Charlottesville administered by LEAP.